Beaufort, Mo. - Saturday morning one person suffered minor injuries in a two vehicle head-on accident on Highway 185, approximately one-quarter of a mile south of Highway 50. Beaufort/Leslie Fire and Gerald EMS responded at 11:40 a.m. to the vehicle crash that left Highway 185 shut down for approximately one hour as southbound traffic was diverted down Kenning Road. 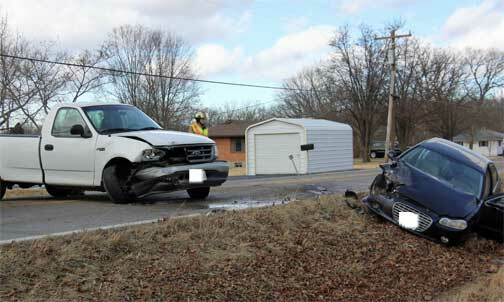 According to the Missouri State Highway Patrol (MSHP) 20-year-old Dustin Harris of Rosebud, Mo., was transported to Mercy Washington with minor injuries by Gerald EMS. Harris’s 2007 Chrysler Concorde sustained extensive damage when he struck a 2000 Ford F150 driven by 80-year-old Philp Hubenthal of Beaufort, Mo. 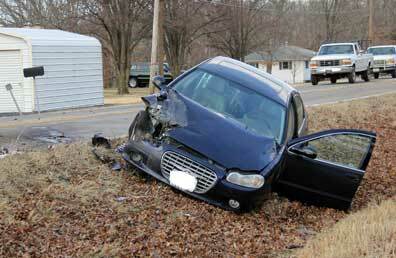 who was uninjured. The MSHP says that Harris was traveling southbound on Highway 185 when Hubenthal, traveling northbound, was attempting to make a lefthand turn, entering the southbound lane and stopped, then reentered the northbound. Harris’s vehicle began to skid, crossing the center lane and striking the Ford F150 head-on, sending Harris off the east side of the highway.